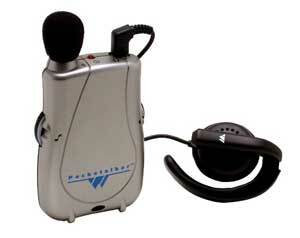 Williams Sound Pocketalker with Widerange Earphone - Weitbrecht Communications, Inc. In the car, in a crowded restaurant, or at a noisy ball game, the tiny Pocketalker helps you hear virtually anywhere! This discreet and portable amplifier can be used duiring one-on-one conversations, in a small group, or when listening to the TV or radio. It can work with a hearing aid to reduce background noise and includes volume control, a microphone input jack, and an earphone output jack. Comes with a 3.5mm jack and will work with any standard 3.5mm jack headphones. *This unit sold with single widerange earphone that hangs over one ear.